Home Blogs The most stunning place in Spain? The most stunning place in Spain? Two cities which have recently become official “sisters”, Ronda (Málaga) and Cuenca (Castilla–La Mancha), are arguably two of the most stunning locations in Spain. Paul Whitelock, who has been travelling throughout Spain for more than forty years, knows both places. A frequent visitor to Ronda for over a decade and now resident there, he also knows Cuenca well. Here’s his assessment. As far as I’m concerned it’s a toss-up between Ronda and Cuenca as to which is the most spectacular city in Spain. Both sit atop stunning gorges – in fact Cuenca has two – and the surrounding views in both places are to die for! Ronda is the home of the Tajo, the 98 metre gorge spanned by the Puente Nuevo, and Cuenca has its Casas Colgadas (hanging houses). Despite the cities being 600 kilometres apart, the picture-postcard image of Ronda and Cuenca can seem almost identical to outsiders, even though each has its own unique and well-defined personality. “It’s incredible. People who don’t know either city very well have to look twice to see the difference,” explains Marta Tirado, General Director of Tourism, Trade and Industry at Cuenca Town Hall. Perhaps it was the similarity in these two cities that, back in 1975, led their mayors, Francisco de la Rosa (Ronda) and Juan Villalobos (Cuenca), to sign a partnership agreement. 35 years later the partnership has been resuscitated after years gathering dust in the archives. In 2010 the official partnership between the two cities was signed and was presented to the public during FITUR, the annual Tourism Industry Trade Show in Madrid, in January 2011. “We’ve started out by working on predominantly tourist initiatives,” clarifies Tirado. “It’s just a starting point and you never know where it could take us. “We’ve put together special offers and discounts on hotels, restaurants and in bars,” she adds. The idea is to motivate residents of both Cuenca and Ronda to visit their sister city. So what do Cuenca and Ronda have to offer as travel destinations? Cultural, nature and adventure tourism mainly. The predominant cultural offer in both Cuenca and Ronda is based on their networks of museums. But Remedios Ruiz, who runs the tourism department in Ronda, says: “… there is also a wide variety of options when it comes to nature tourism.” Adventure tourism is also on the increase as travellers become more adventurous and look for services to help them explore the surrounding area. The landscape surrounding Ronda (the Sierra de las Nieves mountains, the Guadiaro valley, the Sierra de Grazalema) and Cuenca (the ravines shaped by the River Júcar and Huécar) offer endless options for hiking, climbing and birdwatching. Plans for 2011 include the development of both cities as destinations for foreign students looking to learn Spanish and also the promotion of wine tourism. The two cities also have something else in common: the Puente Nuevo bridge in Ronda and the Capilla del Pilar chapel in Cuenca Cathedral were designed by the same man, architect José Martín de Aldehuela. For me Ronda is my home, but Cuenca will always have a special place in my memory. Which is best? I suggest you go and see both and decide for yourself! Oh look, another article about, er, Ronda. I think Paul has been travelling throughout Ronda for forty years lol. I quite like Olvera … it’s pretty, traditional, and hasn’t got money-grabbing locals like Ronda has. Much nicer! Fred – I have to comment in Paul’s defence. 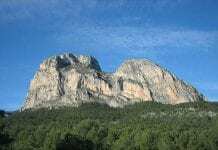 When he was invited to write a blog for the Olive Press web site he was asked to focus on the Serranía de Ronda – hence it’s under the title ‘Paul Whitelock’s View From The Mountains’. Of his 23 articles to date only four are about Ronda. Hardly overkill? Can you get him a bike so that he can go further afield? Well Fred it’s all downhill to the coast, don’t fancy cycling back to Ronda though..! !